I personally love this very unusual and tasty Italian-style Grilled Parmigiano Reggiano Cheese Sandwich version of the classic grilled cheese sandwich. So simple and so good! The pepper makes a wonderful tasting statement along with the Parmigiano-Reggiano cheese, so use whole peppercorns and freshly-grind on your sandwich. Grilled cheese sandwiches can be enjoyed for breakfast, lunch, or dinner. This Grilled Parmigiano Reggiano Cheese Sandwich is also great to serve at a wine tasting, just cut into small finger sandwiches and serve with your favorite wines. One of America’s all-time comfort foods is the grilled cheese sandwich. 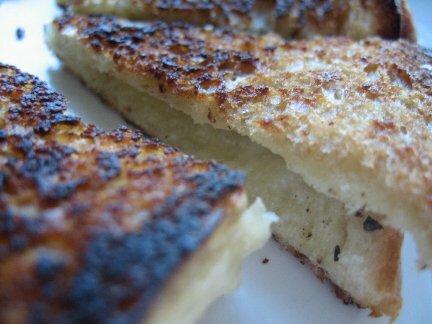 Grilled cheese is a classic American food, and every adult seem to have a story about how their mom used to make it for them. Upscale or downtown, gourmet or simple, the grilled cheese sandwich is back with a vengeance! Generously and evenly butter one side of all the 4 slices of bread. Evenly cover two (2) slices of the unbuttered side of the bread with a layer of the fluffy-grated parmesan cheese. Freshly-grind the black pepper and generously spread over the top of two (slices) of bread. Place the remaining slices of bread on top to make sandwiches (with buttered sides out). Add enough butter to provide a film to prevent sticking. Heat the butter over medium-low heat until melted. I try to maintain a low heat when grilling cheese sandwiches. Add the prepared cheese sandwiches, gently pressing them onto the pan with your hand or a spatula; slowly grill, regulating the heat so the butter does not burn. Once the sandwiches are a light brown, turn the sandwiches over using a wide spatula, and press down with the spatula to compress slightly. Slowly brown the other side. When done, transfer the sandwiches to a paper towel to drain off any excess butter. Cut each sandwich in half diagonally, and serve with your favorite wine. Makes 2 whole sandwiches or 16 finger sandwiches. I have also combined grated cheddar cheese and grated Parmigiano Reggiano cheese. My husband also really likes this version. I am going to take this variation to my next wine tasting to get everyone's comments. Add thin slices or Prosciutto di Parma before grilling. * Bread slices should be between 1/4- to 1/2-inch thick. ** Be sure that your butter is fresh so it will not carry old refrigerator flavors onto your sandwich.